It is important for a company to select an appropriate day when presenting its financial results. With so many companies competing for attention from buy-side, sell-side and financial media, the correct timing of a result can be very important, especially for smaller companies. Understanding where the peaks and troughs are during a reporting season can help a company identify the optimal day to release its results. The busiest week is projected to be the third week in February (Monday 18 to Friday 22) when almost 46% of company’s report. However, the reporting timeline differs depending on company size, with larger companies, on average, reporting earlier. 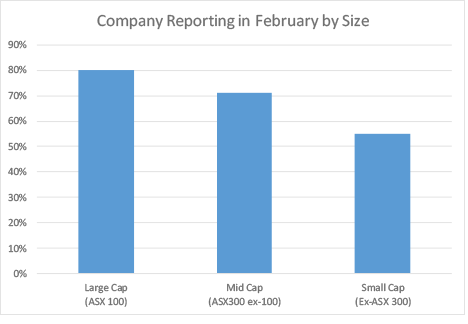 45% of ASX 100 companies will report in the first two weeks of February, compared to 22% of ASX 300 (ex-ASX 100) and just 18% of Ex-ASX 300 companies. 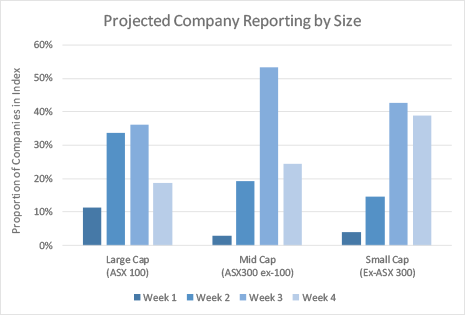 Almost three quarters of Ex-ASX300 companies will report over the final two weeks, while more than half of Mid-cap companies will release their results during the third week of February. 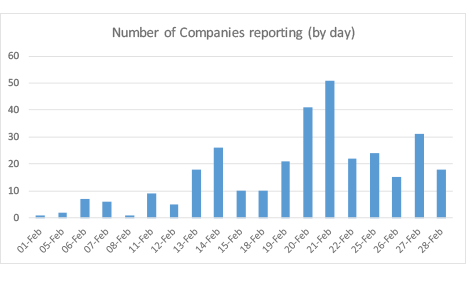 20 and 21 February are slated to be the two busiest reporting days, with a combined 92 companies anticipated to release (29% of all reporting companies). Another notable day is 14 February, which is the busiest reporting day among ASX 100 companies, including four ASX 20 companies (the most of any day). The third week of February will be the busiest reporting week for all sectors apart from Energy, while the first week will be the quietist for all but Utilities. Sectors where more than half of constituents report between 18 and 22 February are Utilities (57%), Consumer Staples (56%), Consumer Discretionary (53%) and Industrials (51%). There are no Consumer Staples, Energy or Healthcare companies reporting in the first week. 1 Projected reporting dates were supplied by Factset on 29 January 2019.